"Quik-Tel Fever Thermometer" by Normadeane Armstrong Ph.D, A.N.P. 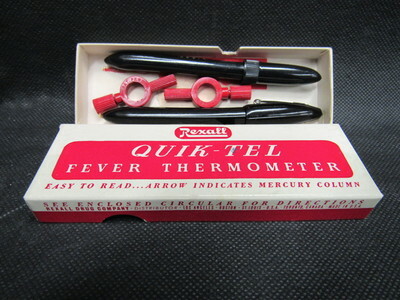 This is the Rexall Quik-Tel Fever Thermometer with "Shake-O-Matic" device and box made in the U.S.A. This item contains two black plastic thermometer cases, two red plastic "Shake-O-Matic" devices, one glass oral thermometer and one cardboard box. When first sold it would have only included one of each item and a set of instructions on how to use the "Shake-O-Matic" device (not found in this set). This Fever Thermometer was sold for home use and a 1951 Life Magazine advertisement for Rexall listed the Quik-Tel Thermometer for $1.39 for either rectal or oral. The red "Shake-O-Matic" device would have been slide on to one of the black thermometer cases after the thermometer had been placed mercury end down into the case. Then once the case was securely closed the user could hold onto the spinning side of the "Shake-O-Matic" device and spin the case. This was done to reset the mercury fluid thermometer inside before taking a temperature reading.